Music Career Myth #1: Music fans don’t buy music anymore. Understand how the music business works today (vs. how it worked 20 years ago). Think innovatively like an entrepreneur. This helps you discover new ways to sell music (and other merchandise) to your fans. Learn how to get your fans to buy your music. Note: some people will always find ways to get your music illegally without buying it. But these people are NOT your fans - they are thieves. These people do not support your music career in any way. Ignore them and focus on your true fans. True fans are loyal to you (or your band). They are willing to support your career if you create enough value for them. Tip: you make a lot more money in your music career by changing your focus from selling music to adding value to your fans. The former gives you 1 stream of musical income. The latter helps you create unlimited new ways to earn money in your music career. (More on this below). 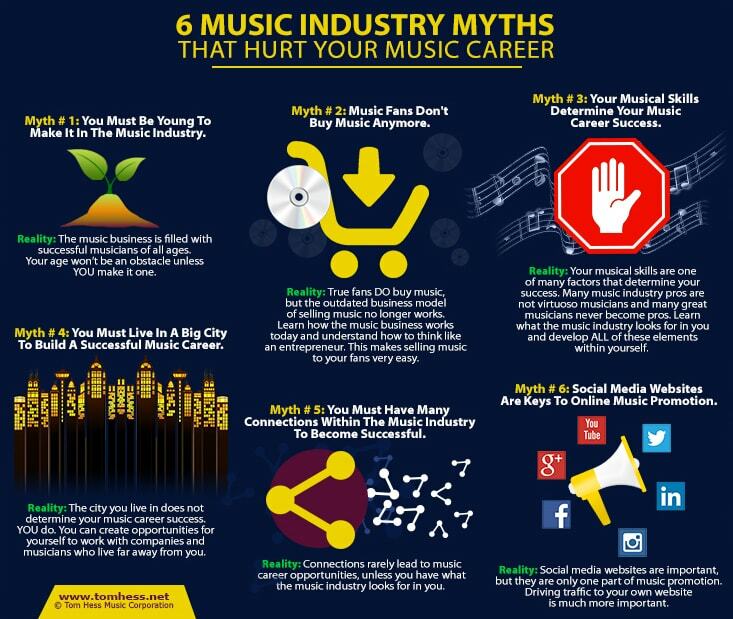 Music Career Myth #2: You must be young to make it in the music industry. Reality: Your age matters very little to bands and companies in the music business. There are thousands of professional musicians in their 30s, 40s, 50s and 60s. The music business is like any other business. When you have value to offer and possess drive, determination and work ethic, you can become successful at any age. Learn what music companies really look for in musicians and develop these skills (more on this below). This makes you highly attractive to everyone in the music industry. Music Career Myth #3: You must become a great musician first, before working on your music career. Reality: Becoming a professional musician takes A LOT more than “good musical skills”. Many music industry pros are not virtuoso musicians ….and many great musicians never become pros. Lesson for you: keep working on your musical skills while you develop the other elements of music career success. Note: You do not need a music degree to become a professional musician. Going to music school helps you improve your musical skills. It does not help you build a career in the music industry. Thousands of people graduate from top music schools every year and struggle to earn money with their talents. There are also far more effective ways to become a great musician than going to a music school. Working directly with an expert music teacher helps you master your instrument a lot faster (for a fraction of the cost). Actually get a record contract offered to you. Get on a tour (and make it profitable). Get into the band you want to join. Earn big money with your music. Sustain a successful music career over the long term. Music Career Myth #4: You must move to a big city with a huge music scene to become successful. Reality: The city you live in does NOT determine your music career success. You do. You can create opportunities to work with companies and musicians who live far away from you. Learn the principles that make music career success possible and apply them. This helps you become successful no matter where you live. Music Career Myth #5: You must have many connections within the music industry to become successful. You have significant value to offer far above and beyond other musicians. You have a reputation throughout the music industry for being trustworthy, loyal, hard working and possessing a business mindset. Record company executives WILL check your reputation in the music industry before deciding to work with you. This article explains the truth about connections in the music industry. Music Career Myth #6. Social Media Websites Are The Key To Online Music Promotion. Reason #1. You don’t really control your social media accounts. Your account can be shut down at any moment (and for any reason). Yes, this has happened to some musicians in the past and it can be devastating to your career. Your own website is the only platform you control 100%. A large mailing list of fans built through your own website is always within your control. Reason #3. Your self-promotion is limited. Each social media platform has restrictions on how you can promote yourself. Your website has no such limitations. This helps you interact with your fans on a much deeper level and grow your career a lot faster. Reason #4. Your website traffic matters much more to the music industry. Music industry executives know that Facebook likes, YouTube video views and followers can easily be manipulated. Your website traffic is a much more honest metric of your online presence. Note: You should be active on social media and grow your presence there as much as possible. Do this while growing your own website at the same time. Learn how to get your fans to buy your music and make your music career more secure. Build a successful career in the music business.